Our in-circuit programmer for PIC's operates on the PC USB port, requires no additional power supply and the programmer application runs under Windows 7/8, Windows XP and Vista. Operates on a simple 6 pin SIL connector and includes the In Circuit Debugger. Supplied with a mini-USB socket. For full details of In Circuit Debugging support see our ICD pages. The PIC Key MX can also power the circuit for programming purposes at 5V or 3.3V at up to 400mA (dependant on the USB port capacity). 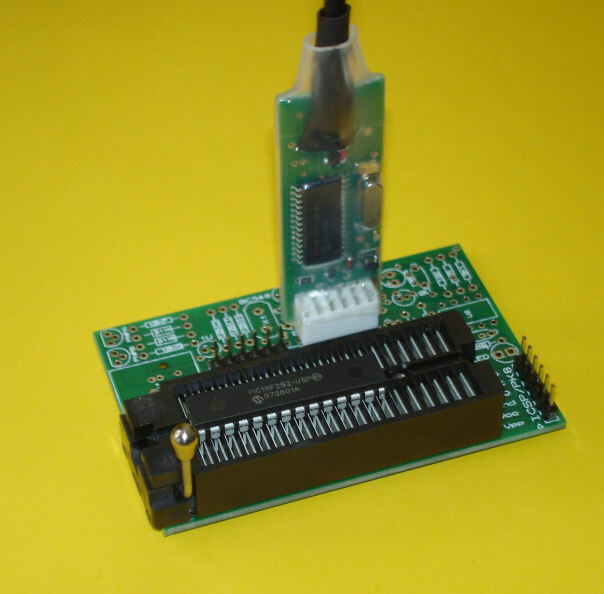 You can also purchase a ZIF socket adaptor so that the PIC Key can be used as a standalone programmer, in this device you can program 8, 14, 18, 20, 28 and 40 pin devices in a standard multi-width ZIF socket. Please click this link for price and ordering information.